Finding Relief on the Streets and at the Office Terrorists are much weaker than we feared in 2001. And sexual harassers are suddenly more vulnerable. In 2001 I thought it would be a suitcase bomb, a homemade nuclear device, not airplanes going into buildings. I’d felt something coming, had written of it, but that day, amid all the grief and carnage, I felt a lurking relief. I’d feared worse—tens of thousands gone, parts of the city rendered uninhabitable. I feel a version of that relief now, after Tuesday’s truck attack downtown, within the shadow of the Freedom Tower. Barely three hours later, on Lexington Avenue from the 90s through the 70s, the streets were crowded with kids and parents out for Halloween. The mood was not a sag-shouldered “This is the new normal,” but a collected sense of “We can handle this.” There was an air of gallant enjoyment. It made the emotionalism of the mayor’s remarks—“We will not be cowed”; “This action was intended to break our spirit”—seem both hyped up and rote, and appropriate to another time. 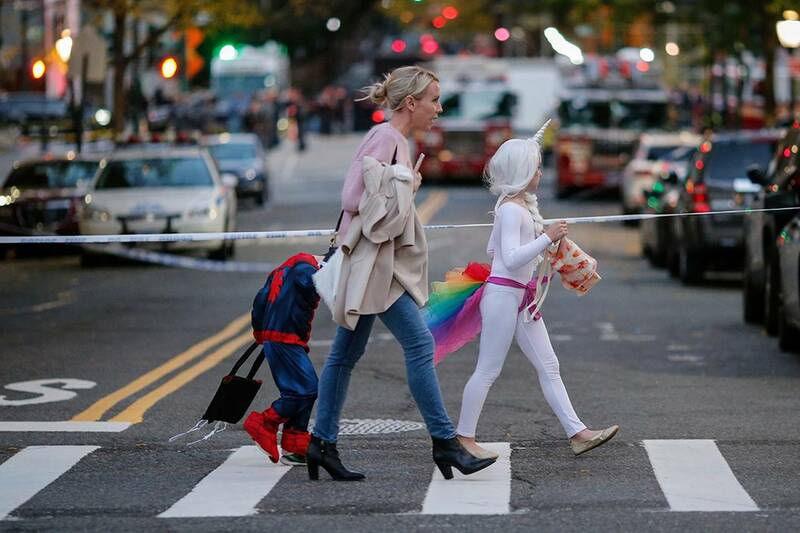 Near the scene of the terror attack in New York City, Oct. 31. Yes, ISIS is here; yes, this will happen again, and security is appropriately high for this weekend’s marathon. But it’s obvious, and has been for some time, that we’re in a different moment, a different part of the battle. For months and then years after 9/11, we feared al Qaeda would hit us again, harder. Sixteen years later what we see is a series of single, random-seeming acts by weak, stupid, highly emotional men who read propaganda sites and become excited in the way of the weak, stupid and highly emotional. Their attacks are low-tech, limited. The bad guys now seem incompetent. But the bad guys will never go away, and it is to the deep and everlasting credit of U.S. law enforcement, especially the New York City Police Department, that they have been so contained. Some day they’ll hit us hard again, so no relaxation of efforts is possible. But right now it feels more like Britain’s long struggle with the Irish Republican Army than an existential threat, and we must be thankful when feelings improve. This was my small epiphany Tuesday night as I moved among people dressed as bumblebees, Pharaohs, Godzilla and an angel with black wings. I liked the gallant enjoyment. I shared it. Here we shift to another thing that has changed, this one permanently. Before it goes away as a regular front-page story—and it will, because as Thoreau said, once you’re familiar with a principle you become less interested in hearing of its numerous applications—it must be noted that what has happened the past month regarding sexual harassment in the workplace is epochal, a true watershed and long overdue. The revelations will have a huge impact, not because men now understand that sexual abuse and bullying are wrong—they always knew, and for many the wrongness would have been part of the enjoyment—but because they now know, really for the first time, that they will pay a terrible price if their misbehavior is revealed. And from here on in, there’s a greater chance it will be revealed, and believed. That there is a price to be paid will have a deterrent effect. Human sin won’t stop; harassment will continue—but something important happened here. In July 2015 New York magazine put 35 women on the cover who alleged that Bill Cosby had sexually violated them. Until then it had been a cloudy, amorphous story. Suddenly it was no longer he-said/she-said: You saw the faces, read the testimony, and knew what Mr. Cosby really was. A year later Gretchen Carlson, and later others, went up against Fox News’s Roger Ailes ; her lawsuit was settled for $20 million. Then came the revelation of the Bill O’Reilly settlements. But Black October for sexual harassers began with the New York Times stories by Jodi Kantor and Megan Twohey on Harvey Weinstein’s history of abuses and payoffs, followed by Ronan Farrow’s lengthy investigation in the New Yorker, and then on to other men in show business and the news media. Something happened. Media outfits made a commitment—expensive in terms of resources, personnel and legal costs—to get the story. What they found was numbers—the sheer number of abusers and the number of accusers who’d testify. They discovered details that established patterns. This is all good. And one of the things that fell is the phrase “everybody knew.” That is now a self-indicting phrase. I close with a point that may grate on those who, like me, are glad at what has happened and wish to see just revelations continue. The challenge is to pursue justice while keeping a sense of humanity. Human-resources departments terrified of costly lawsuits will impose more and stranger rules that won’t necessarily thwart bad guys but will harass good men. This is the way of things. Two recent anecdotes: At a yearly checkup, a male doctor went through his short list of how to stay healthy in New York. It included: don’t stray onto the curb, stay on the sidewalk, keep back from careening trucks that take a corner too tight and knock people down. I got it, I said—I take the arms of cellphone zombies and guide them a step back to keep them safe. I’d done it recently with a young woman. He got a poignant look. “I can’t do that now,” he said. If he put his hand on a strange woman’s arm, it might be misunderstood. I was told the other day of a news executive who complimented his co-worker on her boots. He was later taken aside by a colleague: You can’t talk like that now! He hurriedly called the woman and apologized: He meant no offense, didn’t mean to sound leering. She said: Are you kidding? I knew it was a compliment, no offense at all. That was human. Common sense is better than antihuman edicts. It’s good the pendulum has swung. You want it to hit the bad guys hard, and leave the good ones untouched. Will Virginia Teach Trump Fans a Lesson?